" The Book of Presidents - 1959." (1187) The Book of Presidents - 1959. 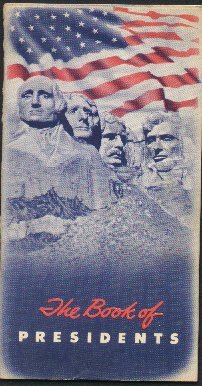 Condition: Very Good Interesting Patriotic Booklet that lists all of the presidents through Eisenhower. There are small black and white portraits and photos of each president, with special facts about each presidency. Also includes information about the Presidency, Supreme Court, Electoral Vote, voting statistics by state in 1948 and 1956, plus much more. Glass stain on back page. Very interesting historical look at voting in America. Booklet measures 4 1/4" by 6 1/4" and has 24 pages. Price: $4.00 + shipping.